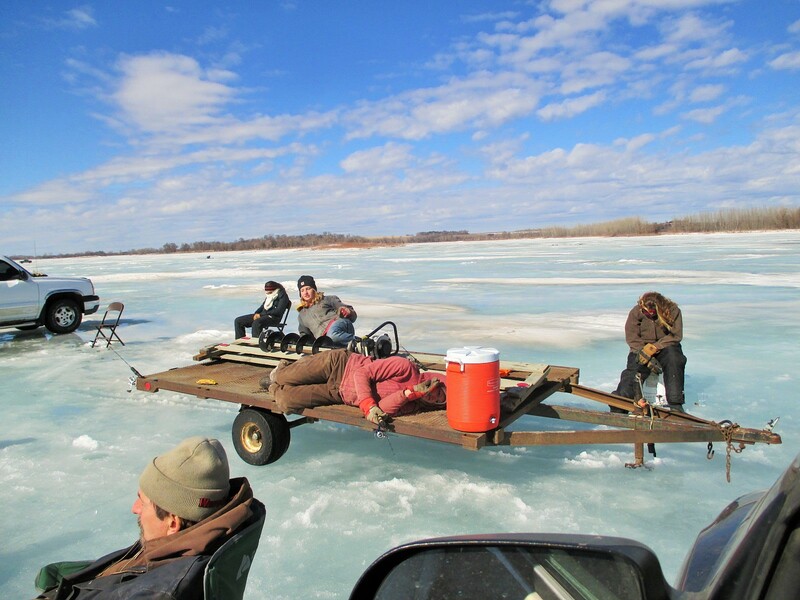 Ice Fishing, a Minnesota Tradition! 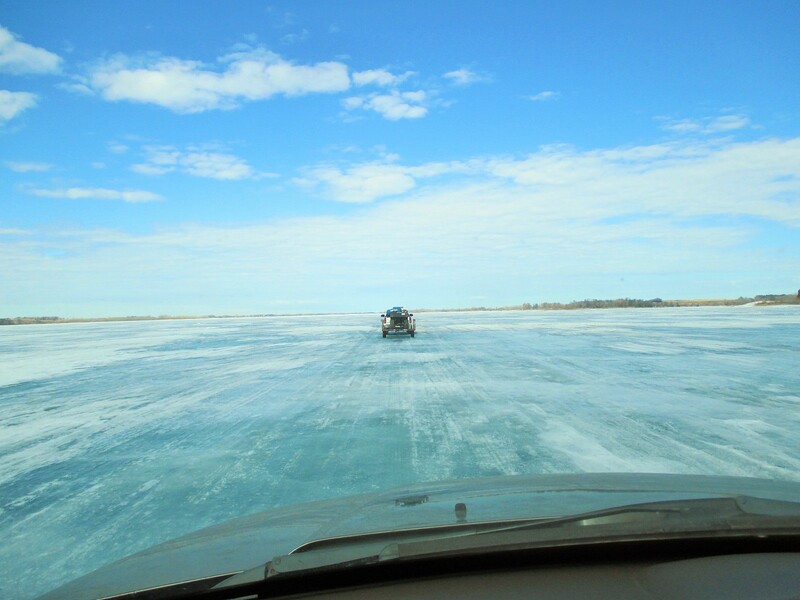 The view driving on a frozen lake. 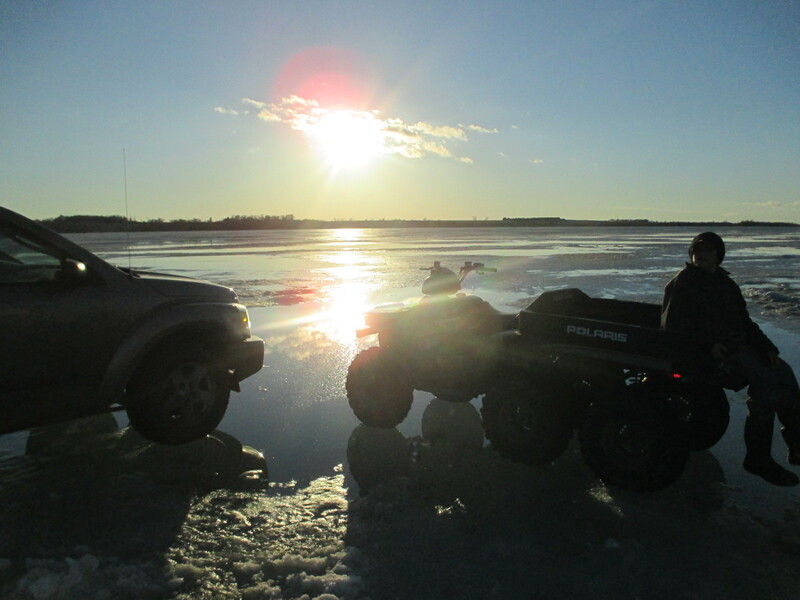 When we made it to the fishing spot I was pretty excited to get out! 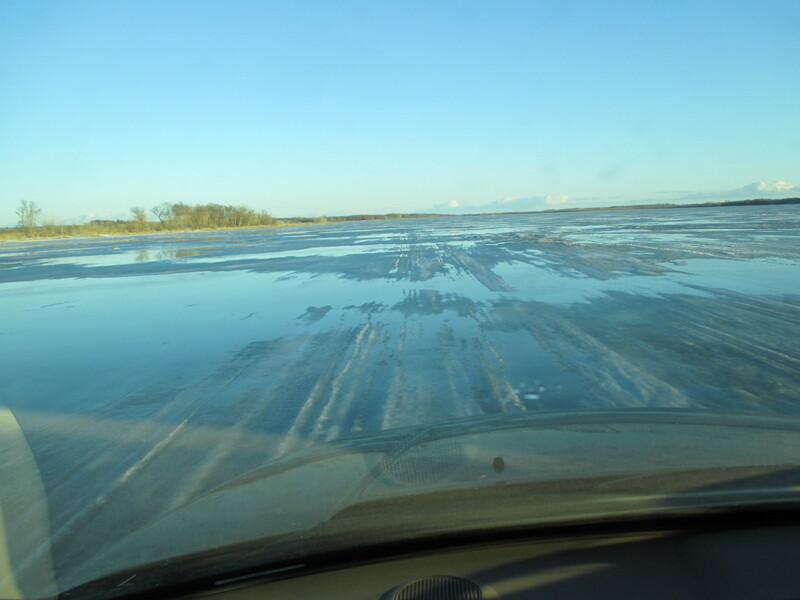 I’m not sure but it could have been almost two miles we drove on that frozen lake. Don, our guide, immediately starting drilling all of our holes. 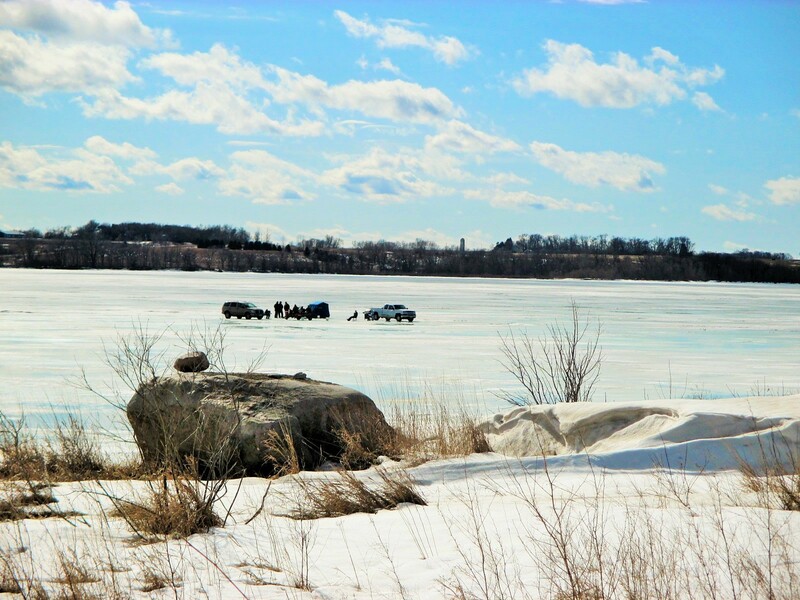 He measured the depth at 32″ of thick ice. Nice!!! 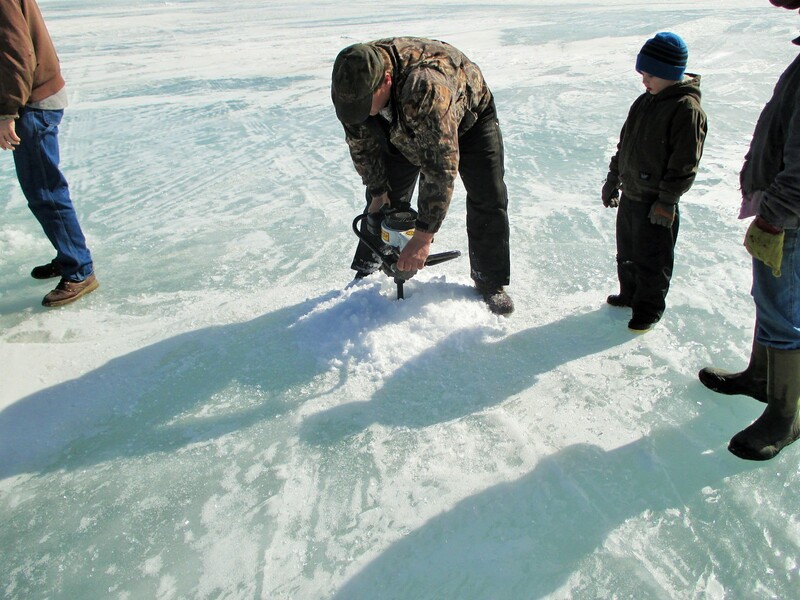 Don digging our fishing holes in 32 inch thick ice! Let the men do all the work setting up while we pose for some memories! Not a worry in the world, after all it is Sunday, a day of rest. Most of us like early mass at 8:30 a.m. so that the day is longer and we can plan some outings. On this particular day we were on that ice by 10:30 or so. 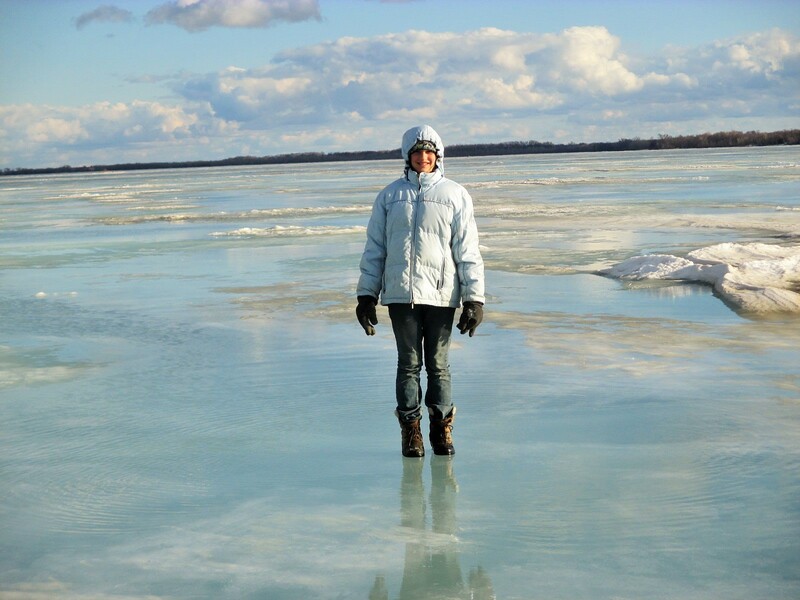 Walking on water and loving it too. 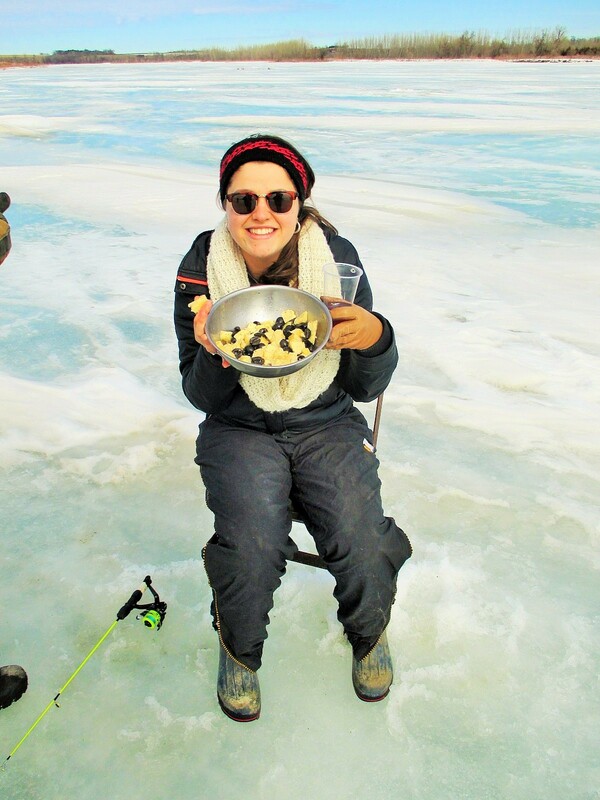 Half or most of the fun is visiting and eating on the frozen lake. 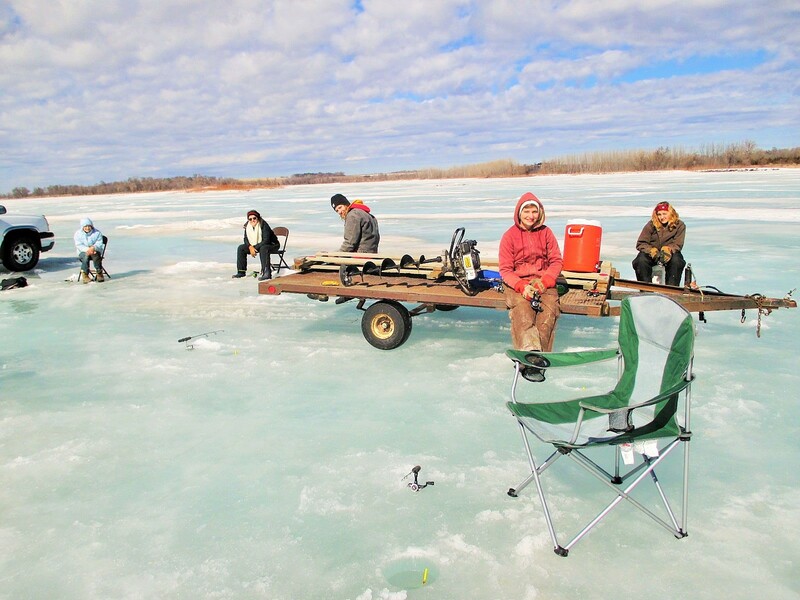 Nobody complained that we didn’t catch any fish that day. 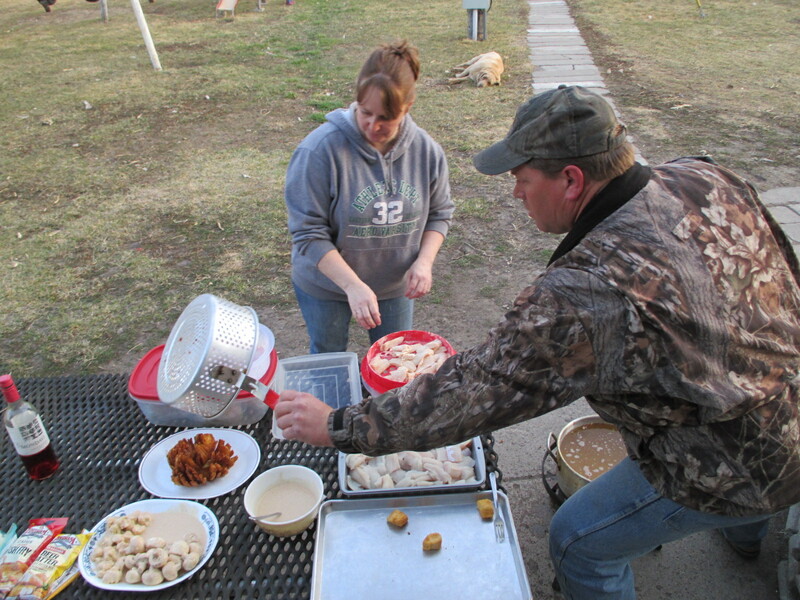 Secretly we knew that Don and Angela had some fish frozen for a soon to be fish fry……which actually happened last Friday night. So, the pressure was off. That’s my niece Carrot sharing the marinated home- made cheese and olives soaked in olive oil and garlic! Can’t you just smell it? Fire up the grill, we’re getting hungry now! 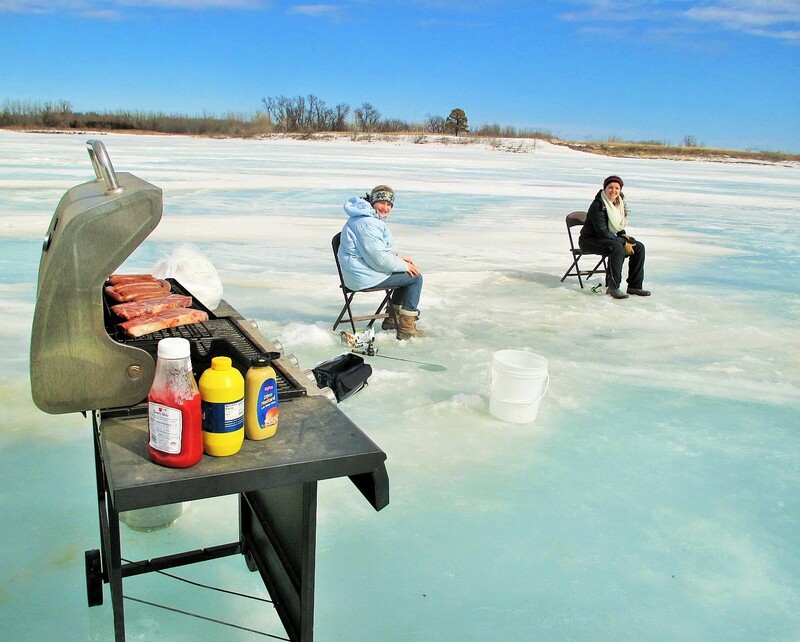 This grilling on an icy lake was new to us but it sure smelled just like a picnic on a summer day. The joy of modern conveniences; the smell of summer filled the frozen winter air. Where’s the beef? Why in the meatballs of course! I didn’t plan ahead so was unable to make Stromboli. 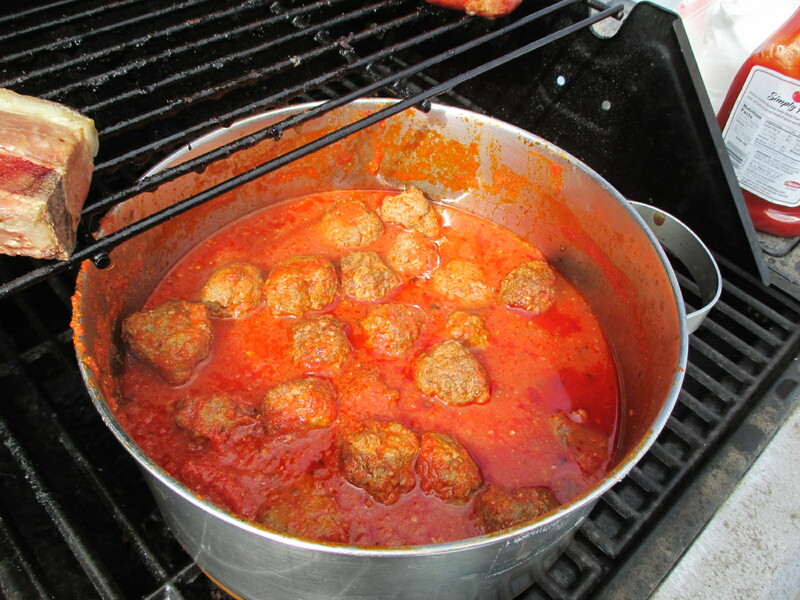 Meatballs with plenty of hot sauce to warm up a body on ice! 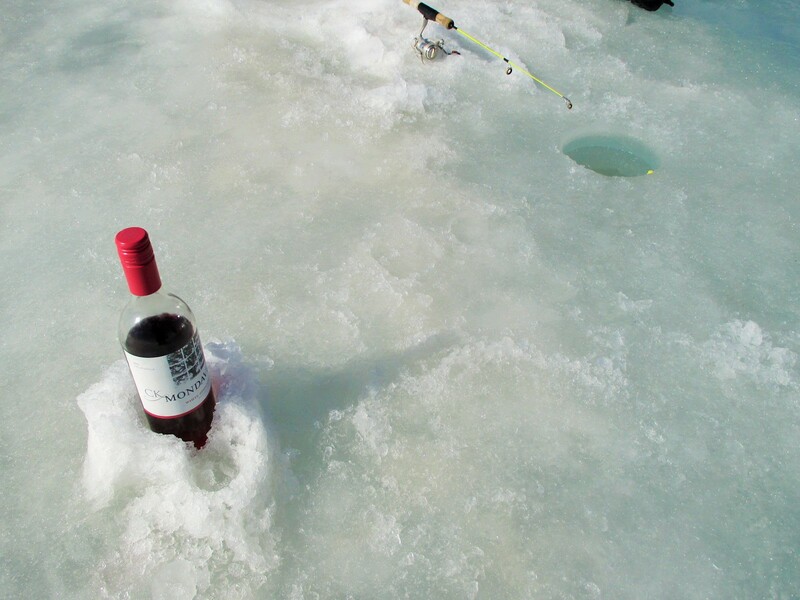 Not only do we eat well but some of us enjoyed a little home-made wine chilled to perfection! If you have ever tasted Elderberry wine you will recall the almost immediate heating effect you experience from the inside out. Home-made Elderberry wine on ice. A very warming wine! Time for naps; anyone awake yet? I think we spent 6 hours out there. The day was fairly warm and sunny. Fairly warm meaning we only just barely froze. There was a warming tent with a heater for some of us with wet feet. My jeans soaked up the water like a wick………and I actually went in the tent to remove my shoes and socks, wringing out a bunch of water. Even this was fun! Almost time for chores. The sun tells us so! By this time we were getting pretty cold and packed up to head home. You could almost hear the cows as they waited impatiently for the kids. I followed the tracks of the other fisherman. Another beautiful day, now only a memory. Now fast forward to the Friday night fish fry. 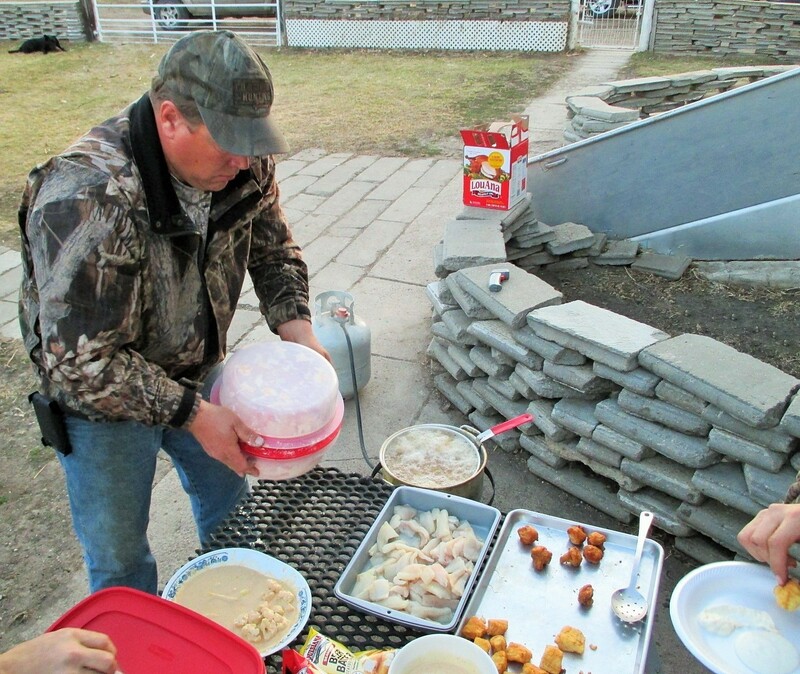 Don and Angela put on a feast of all we could eat fish on our farm. It was so delicious. Angela and Don cooking up fish fried onions, mushrooms and cauliflower. Delicious! Now gone is the snow just a few weeks later and out come the rakes and summer clothing. Now begins the longer days of spring farm work. Out comes the aloe for those of us with sunburns. 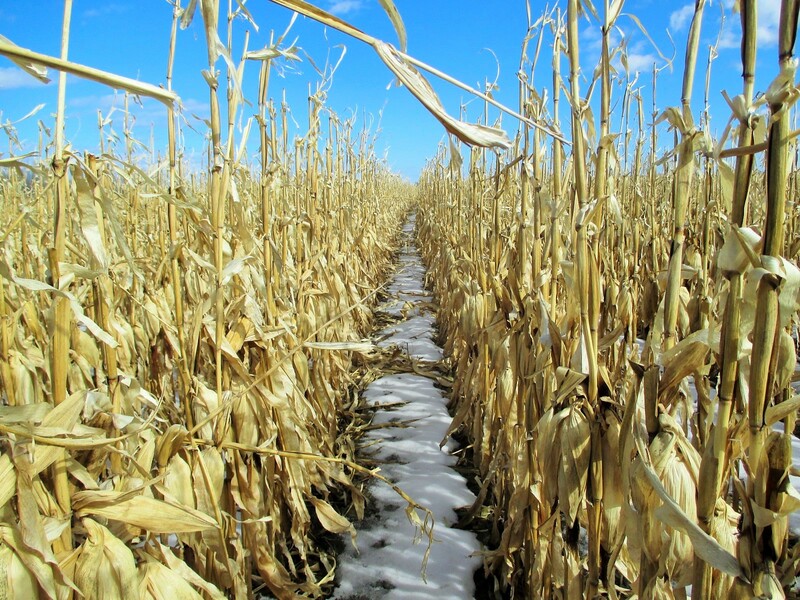 Winter of 2015 is only a memory…………or is it? You never know because we live in a land of extremes. Better keep the boots around just in case. 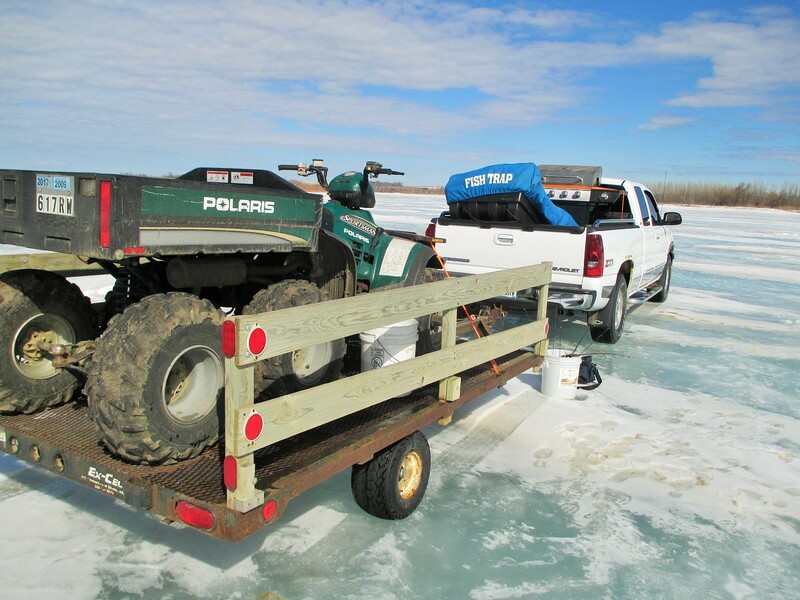 Click the link below for a successful ice fishing trip! Wow! 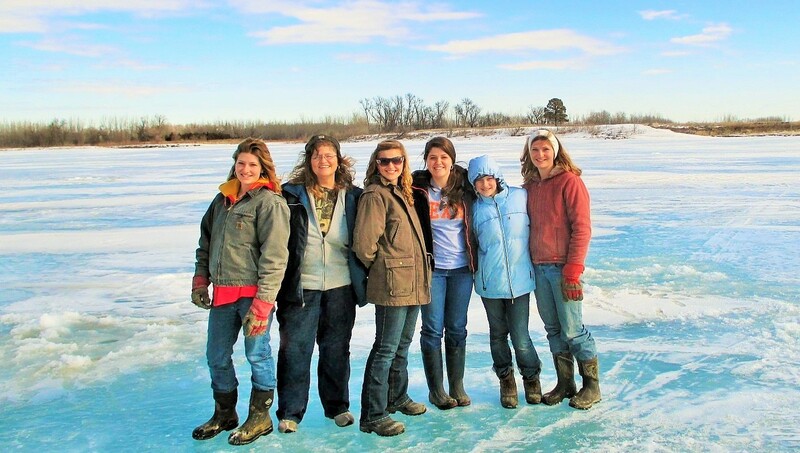 You guys know how to live it up even when its freezing! Love it!